A relative of a client, Danae Zachari, was inspired to volunteer abroad. She researched a number of Non-Governmental Organizations (NGOs) and made her selection. In 2012, she was sent to work at a hospital in Koforidua, Ghana. During this trip, she worked side-by-side with medical professionals in the hospital, helping in the emergency ward and sourcing supplies and equipment to keep the facility running. When her term ended, she realized that the NGO hadn’t made quite the impact that she expected. While she felt like she contributed, Danae felt more could have been done by the NGO to translate donor funds into direct sustainable improvements. In short, for Danae, her observations and reflections on this experience were life-changing… and soon to be life-changing for the two communities within the City of Koforidua, Ghana. Once she arrived home, Danae and a group of friends founded their own grassroots organization called the Dwumadi Project Ghana (DPG) with the support of their professor. The goal of the Dwumadi Project is to support the communities of Koforidua, Ghana and their initiatives in a sustainable way. DPG is led by a team of students from the University of Victoria and Camosun College. To date, they have raised funds for and completed three of five projects as requested by the elders of the Zongo and Magazine communities within Koforidua. 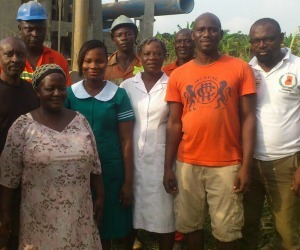 A local committee in Koforidua carried out these projects, including two assemblymen, chiefs, the doctor of the Zongo clinic, the head nurse of the Magazine clinic and the project representative who translates and reports back to the volunteers in Canada. – Building a walkway pavilion to connect the two buildings of the Zongo community clinic. The construction of a proper path and a walkway pavilion will ease the transportation of patients and save valuable time during emergencies. Currently the Dwumadi Ghana Project is seeking donations to finance the above project list. 100% of the donations are applied directly to the project. All operating and travel expenses are covered personally by The Dwumadi Team. If you are interested in supporting the Dwumadi Project Ghana, please connect directly with them through her crowdfunding website at http://www.gofundme.com/dwumadi. You are also invited to visit http://www.dwumadiprojectghana.com to learn more.